Geraldine Coates shares her experience of judging at one of world’s most adventurous cocktail competitions. Now that the dust has settled on the third and surely most spectacular Global Final of Bombay Sapphire’s World’s Most Imaginative Bartender contest it’s time to reflect on just how special this competition is. The idea that a bartender’s imagination is the only limit to what he or she can produce in a drink is really boundary pushing. Even better is when the fourteen finalists from all over the world are taken on a trip of a lifetime to help inspire their imaginations. From croquet on the lawn of a traditional English country house to visiting the new home of Bombay Sapphire in the heart of the English landscape the contestants were immersed in classic British experiences. As a judge of the semi finals stage of the competition it was fascinating to see how many of the bartenders had translated their impressions of being in the UK into their creations. My fellow judges Jacob Briars, Will Brix and last year’ winner Matto Vanzi were treated to delicious drinks that featured very British tastes such as tea, marmalade, sherry and jam, any of which could have been a winner. But from the minute the ultimate winner, Remy Savage of the Little Red Door in Paris, started making his presentation it was obvious that we were looking at something truly original. 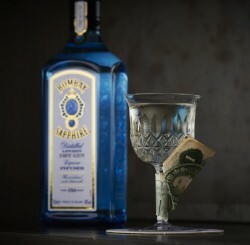 As Remy explained: the starting point of his drink – the Paper Anniversary – was the history of Laverstoke Mill (the site of Bombay Sapphire’s new distillery and visitor centre) as a specialist paper mill making the banknotes for over one hundred banks throughout the world in its heyday. He wanted to recreate the smell of paper, that glorious fresh and complex aroma that greets you when you open the pages of a brand new book. Essentially he made us a type of a wet Martini using Bombay Sapphire but instead of vermouth he created his own ‘paper syrup’ consisting of sugar and water, vanilla, fresh cut grass, gentian root, Suze liqueur and Laphroaig 10 year old. To this he added a dash of salt in solution. Astonishingly this combination really did taste of the smell of new paper – dry, woody, slightly new mown grass with a lingering vegetal sweetness – delicious! Brilliantly he also sourced some of the original banknotes made at Laverstoke to decorate his drink as a final touch. In terms of imagination, creativity and sheer style Paper Anniversary is a winner. The recipe for it is given below. In the meantime we cannot wait to see what next year’s WMIB brings. Well done to Remy. Stir all ingredients with ice and strain into a cocktail glass. Let infuse for 24 hours and filter.